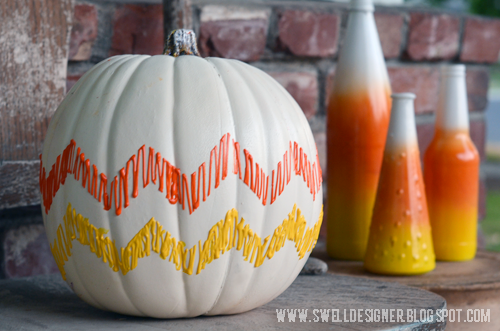 I’m really excited to share my first pumpkin of the season today here on the Swell Life blog! 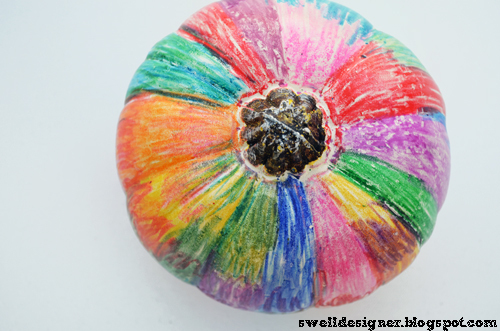 As you know pumpkins are my favorite thing EVER to craft, so I’ve been having lots of fun dreaming up ways to make a pumpkin POP for Halloween. 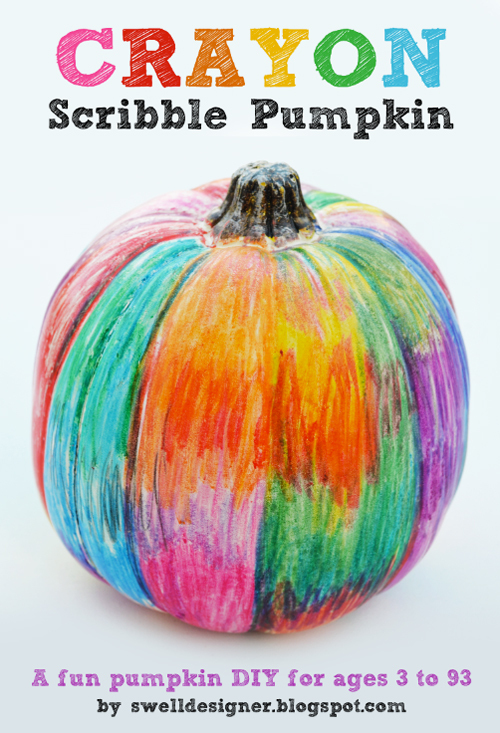 Last year, I had my crayon drip art pumpkin go viral, so I decided to revisit the use of crayons and this one doesn’t require anything other than a pack of crayons and a good ol’ pumpkin! 1. 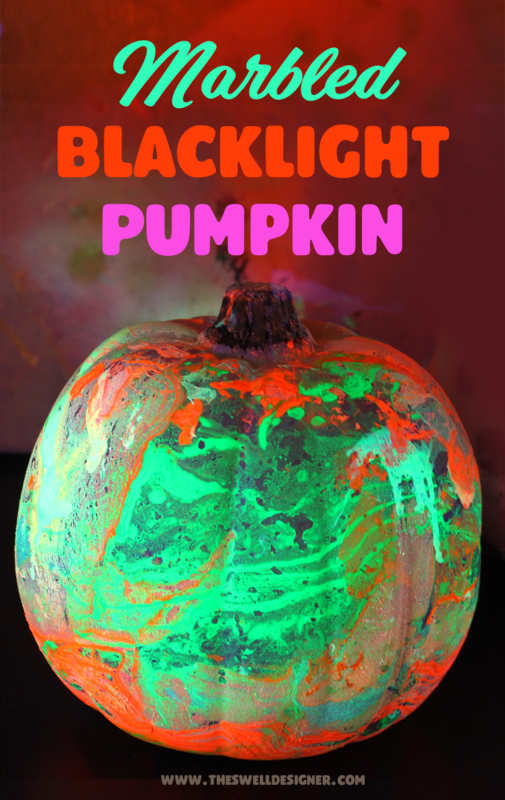 I tested this both on a foam and real pumpkin. It works great on both! 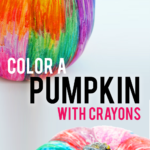 Of course, brighter color crayons will produce better results. 2. Play around with patterns and scribbles for your own design. You may decide just to do an initial or something Halloween-y like a bat or skull. The possibilities are endless. 3. 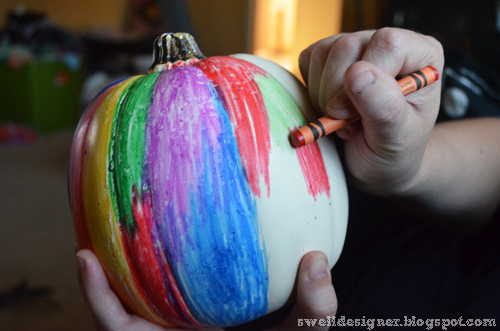 I recommend doing this on a white pumpkin, though you can try darker colors like black and purple on an orange pumpkin. The white just takes so well to the color! Here’s a couple more views. As you can see, it was hard to get in around the top of the stem, but, it really doesn’t affect the overall look if it were to sit on your porch or on display in your house! 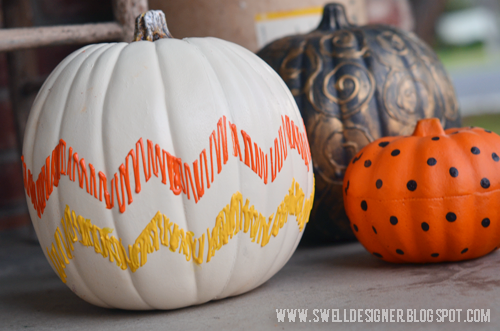 I would love it if you stay a while and check out some of my other fun pumpkin designs. I have over 30 fun tutorials to get inspired by. 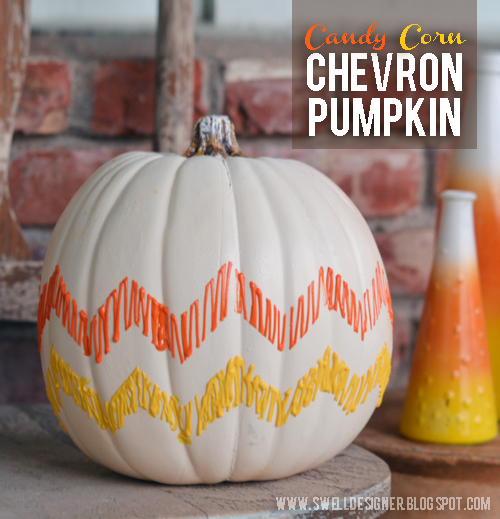 Here’s a cute Halloween pennant project you can whip up in an afternoon that will get you spirited for Halloween. 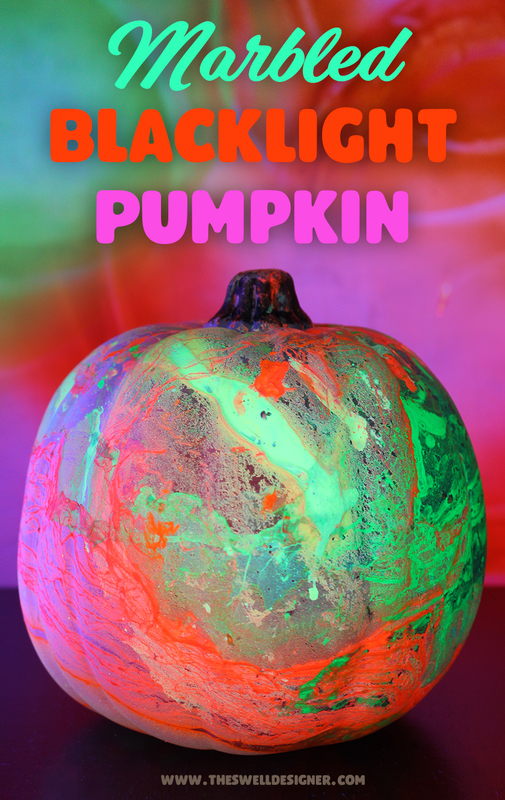 And it’s in my favorite colors…black, white, orange, and purple! Here’s how you make it! 1) On a large piece of paper, draw a triangular pennant shape with your pencil and ruler. Cut out the pattern. 2) Trace the pattern lightly with pencil onto your cotton t-shirt material. 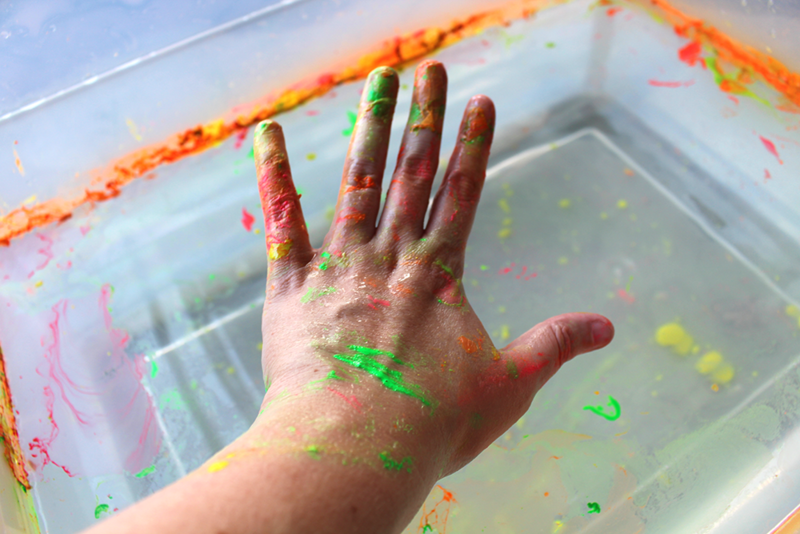 3) Spray the back of your material with Tacky Spray in a well-ventilated area. Press onto the foam core and smooth out any air bubbles. 4) Using X-acto, cut out mounted material on foam core following the pattern you lightly sketched on. 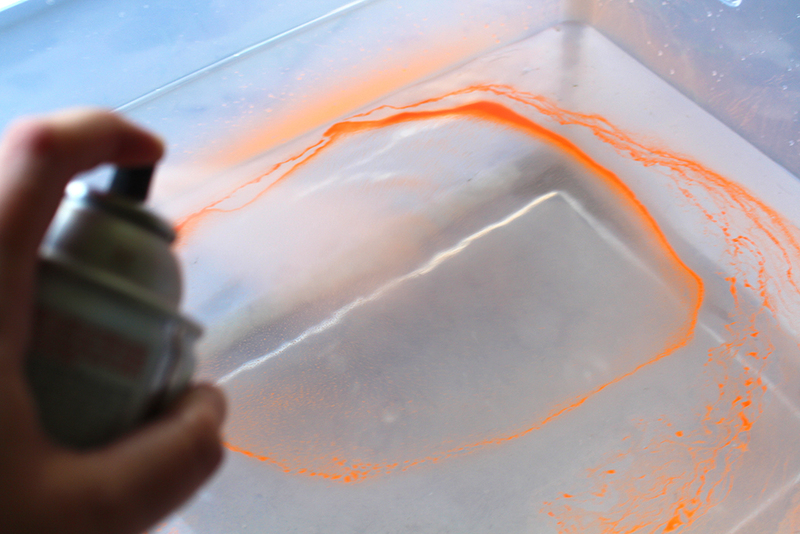 5) On your paper plate, squeeze out orange Scribbles paint. Load pouncer and dab a couple of times on paper plate to remove excess. Randomly dot polka dots all over pennant. Let dry. 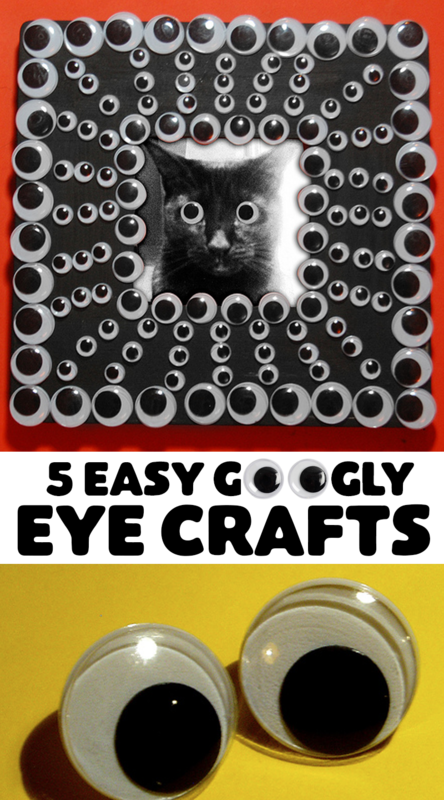 6) Cut out 3 3″ circles using pinking shears from black felt. 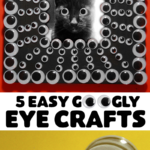 Cut out 3 2″ circles from white felt. 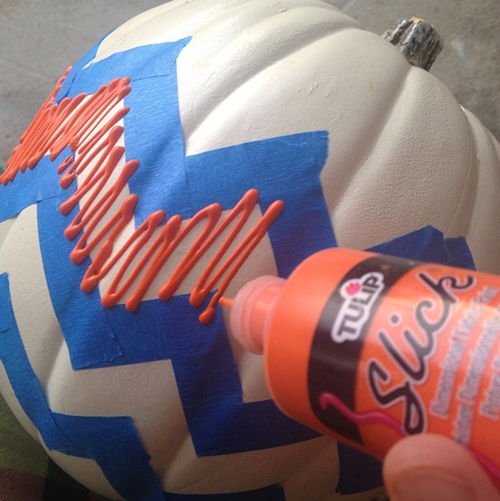 Use Tacky Glue to mount the two pieces to each other. 7) Draw dots and lines on the black felt as shown using the orange and purple Scribbles paints as shown. 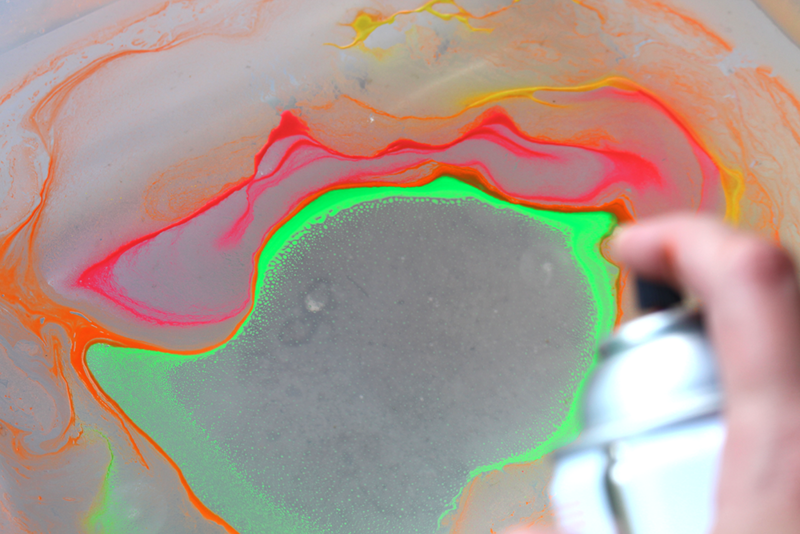 On the white felt, draw the letters B – O – O in a swirly fashion with Black Scribbles paint. Once dry, glue these three pieces onto the pennant. 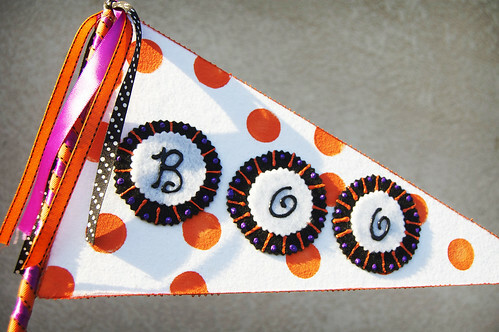 8) Run the orange eyelet ribbon around the edge of the pennant with Tacky Glue. 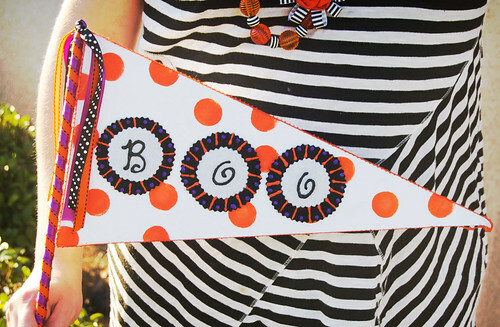 9) Run the orange eyelet ribbon around the edge of the pennant with Tacky Glue. 10) Using Tacky Glue wrap ribbon around dowel rod. I first used purple up and sown the dowel, then wrapped orange around the dowel to create a fun barber shop pole effect. 11) Cut 3 different ribbons in 1 foot strips. Tie in a knot in the middle. Glue on top of dowel rod with Tacky Glue. 12) Using glue, attach ribbon-wrapped dowel to pennant. Let dry. 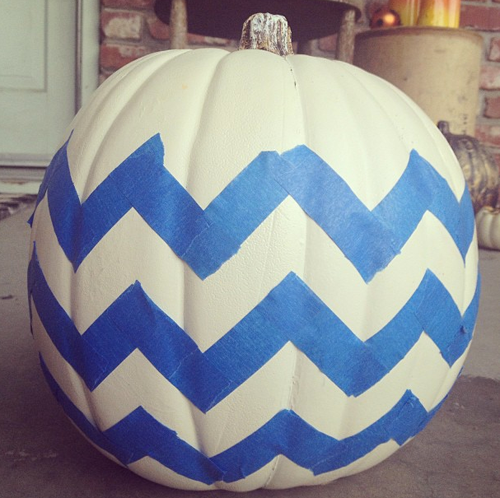 Now you have a fun and festive accent to take with you trick or treating or to display on your porch or by your pumpkin! Here’s a fun detail! I love how vibrant and funky the colors turned out!! Hope you enjoyed this little project! P.S. I linked this up at the following Linky parties! It’s that time again! I am hear to officially present the first fun and frightful roundup of Terrorific Tuesday for 2010. 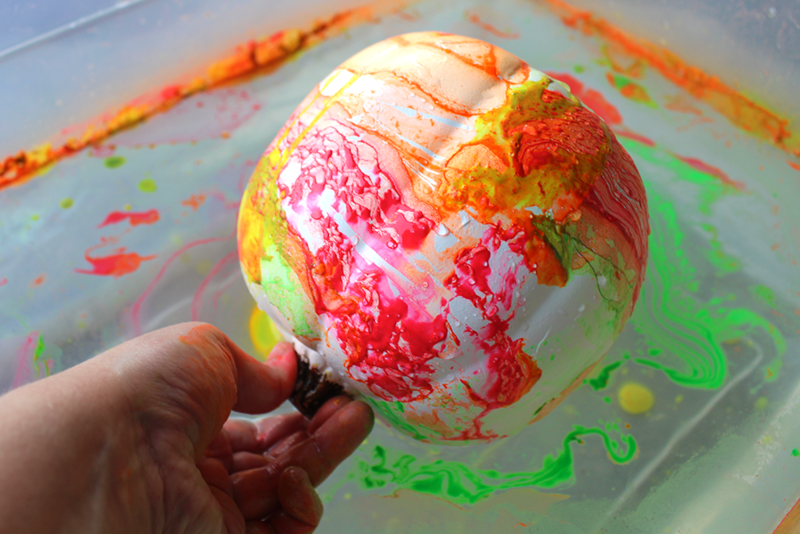 So sit back and relax with your hot apple cider or Starbucks Pumpkin Spice Latte (whatever you prefer) and get ghoulishly inspired by the projects below! Kate Pullen shares 3 cute digital stamps Free cute spider digital stamps. Phyllis Dobbs makes an easy Halloween Decopauge Pumpkin Treat Basket. Jenna Excell shares her super cute and spooky Bones Halloween Apron. 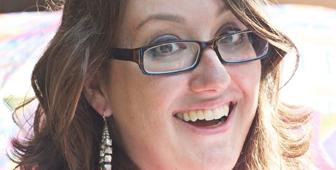 Korinne Zimmerman a.k.a. Crafterella makes a wonderful spray bleach shirt using an adorable Moon Owl Stencil. Glory’s Mischief haunts her house with her Faux Cats in window. 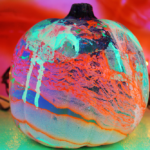 Ann Butler makes this boo-tiful Reverse Collage Decopauge Jack-o-Lantern. Eileen Hull tucks away Halloween cards in this fun Sizzix ScoreBoard notebook pocket. Silvia Chenault and Patty Cappelluti share two super spooky projects on Silvia’s blog: Vampire Art and Creepy Mirrors! 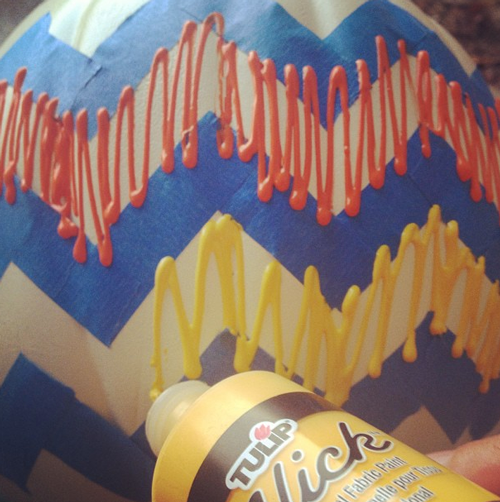 Pattiewack shows you how to make this cute and Wicked Pillow. Messy Missy brings the LOLs with her Mean Kitteh. Alexa Westerfield a.k.a. 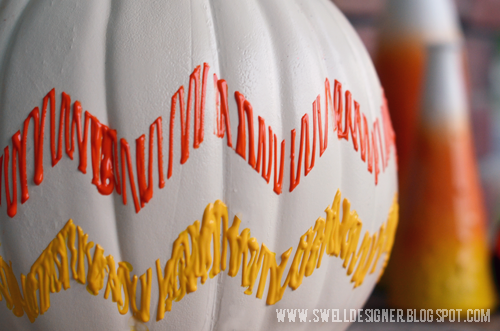 Swelldesigner whips up a Cute Candy Corn CD Cupcake Stand . Kathy Murillo a.k.a. Crafty Chica delights us with glittery Skull Bookmarks. That’s it for this week! If you are interested in playing in my fun Terrorific Tuesday roundup, e-mail me at swelldesigner (at) gmail (dot) com and she’ll send you the details! 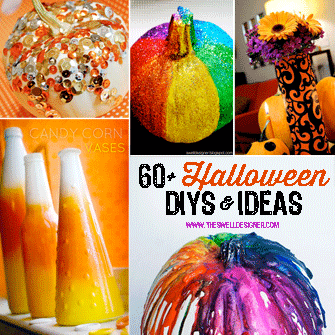 Another week, another fun roundup of Halloween craft ideas! I want to give a shoutout to everyone who has participated over the past few weeks! I can really tell that you guys have really enjoyed sharing and making your projects. I think there is something about Halloween that enlivens people and gets them excited about crafting throughout the holiday months! I know it puts some mojo in my holiday step! Candace’s diabolical plan to populate the world with zombies continues! Come make a spooky spice rack with Crafterella, she’s sharing her unique labels with everyone! 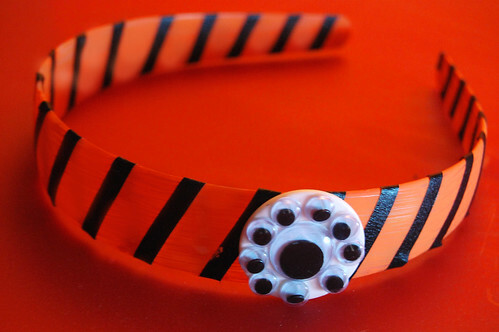 There’s no reason to spends lots of cash on buying Halloween jewelry accessories when you can make your own for yourself or family friends in minutes! Here’s some super swell and cute ideas for making sweet button earrings that won’t break the budget! 1. Lay out your buttons in front of you and play with the different shapes and sizes stacking them on top of each other until you figure out your configuration. You can do exact sets or mix and match styles if you want. Halloween is a kooky time anyway, so have fun with your jewelry! 2. Use a small amount of Liquid Fusion glue to glue your buttons together. Let dry. 3. 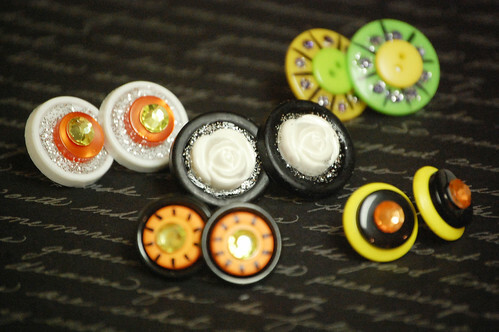 Glue your finished stacked buttons to your earring posts. At this point I usually set my buttons face down on a flat surface so that the post sticks straight up in the air. Let dry. That’s it! Have fun with this! Add to the button goodness by doodling around your buttons with a permanent marker (use clear nail polish to seal it) or by sprinkling a little glitter accents. Another fun idea is to bling up your earrings with mini rhinestones. 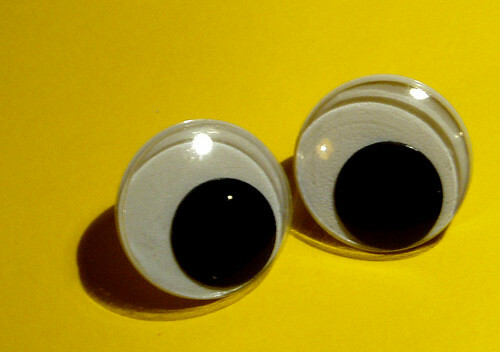 Also consider going goofy by adding some mini googly eyes! The sky’s the limit (at least that’s what a witch told me…hee hee…I realize that was really bad and so not funny). 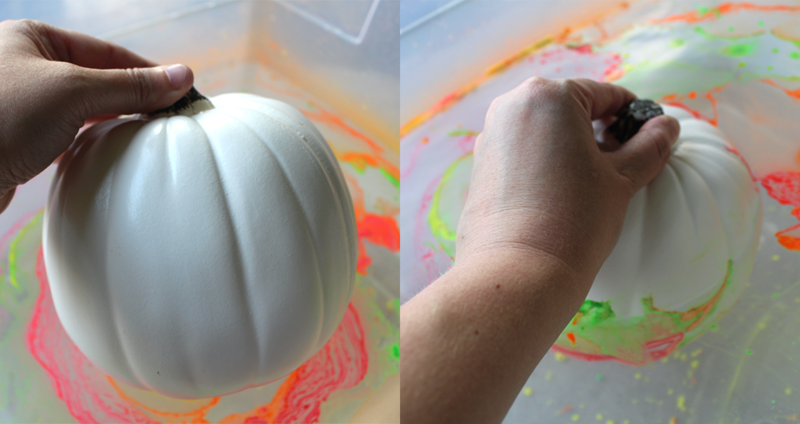 Check back next hour for another Spooktacular Halloween craft! Terrorific Tuesdays are back! This first Tuesday of the month, I’ve rounded up some awesome inspiration that will hopefully give you ideas or inspire you to join in! 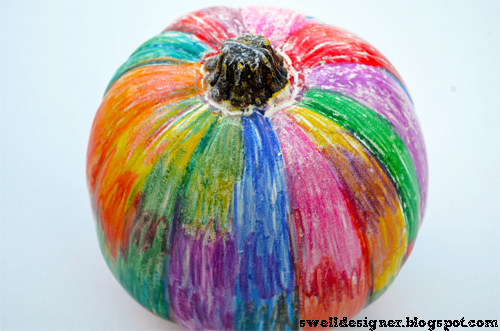 If you would like to join in and create a project, craft, story, poem, photo…or anything else creative and relating to Halloween, e-mail me at swelldesigner@yahoo.com. Make sure to include “Terrorific Tuesday” in the subject line. 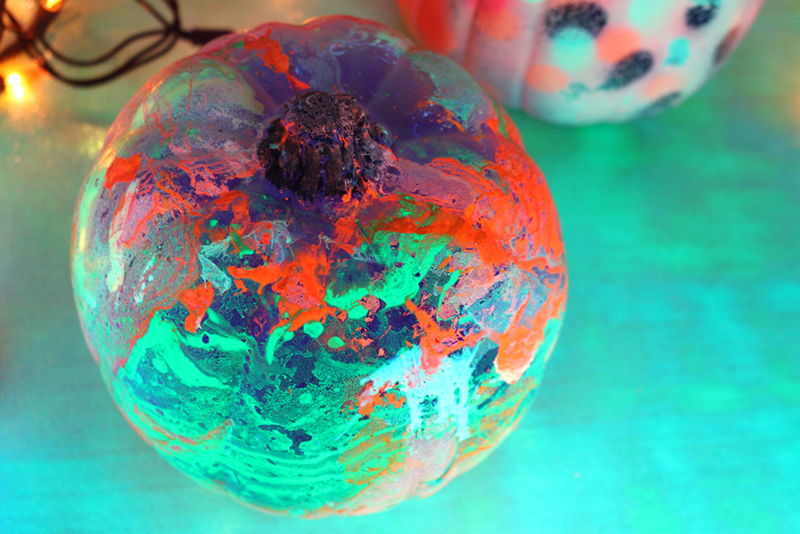 This week’s roundup include jewelry, fashion art, spooky décor, and much more! So sit back and enjoy this helping of Halloween goodness! 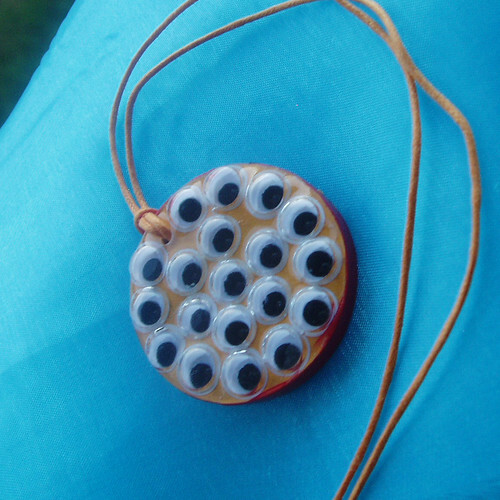 Creep out your friends with this Leatherface-esque collection of eyeballs strung on hardware! Halloween is right around the corner and Madge kicks off the season with a stunningly spooky mixed media necklace and a bonus short story sure to send shivers up your spine! Kids will love dressing up this cute doggie in different costumes with this Halloween Doggie Dress-Up Free Printable! 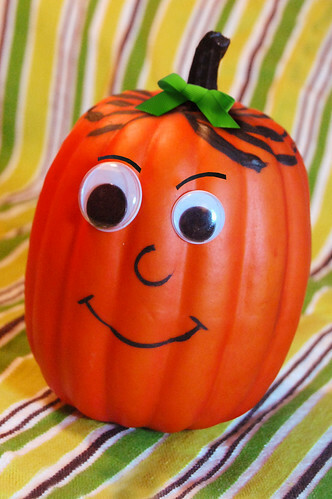 Create an adorable jack-o-lantern baby bib for your favorite little one! 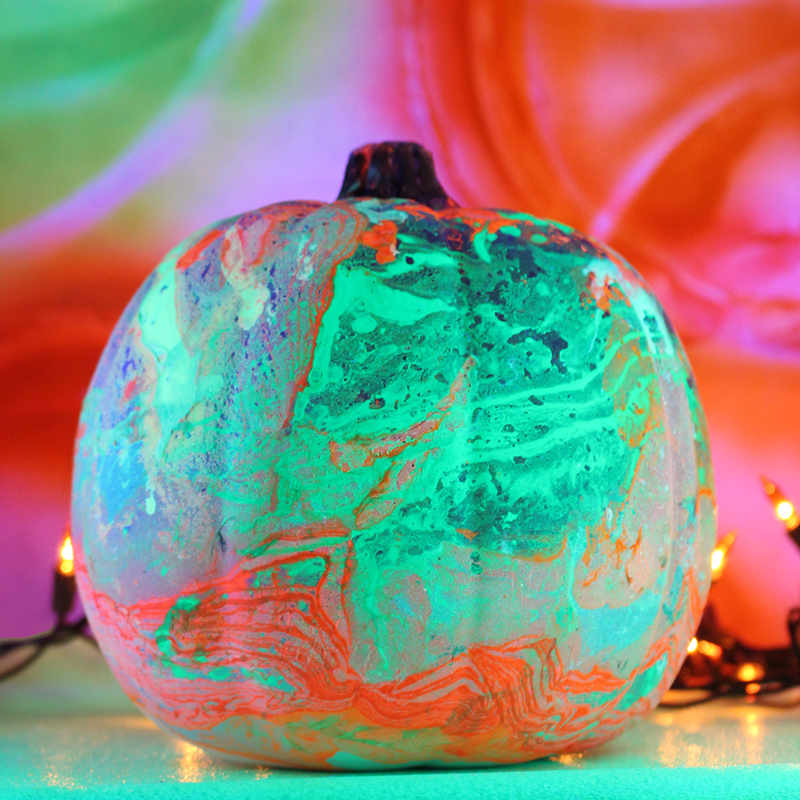 Join Crafterella in making you own spooky Mantipi specimen jar (with tutorial) using polymer clay. Welcome your guests with this cute and creepy Spooky Spider Wreath wreath! Melissa creates a simple skully necklace to celebrate the season. Create a Halloween pyramid box perfect for use as a Halloween favor box or as an unusual decoration. Take your look to the Darkside with these Twilight Romance tees, perfect for Halloween festivities or everyday adventures! 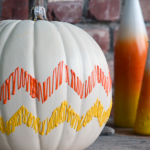 These sparkly Candy Corn Riot earrings are made using real candy corn! No kidding! 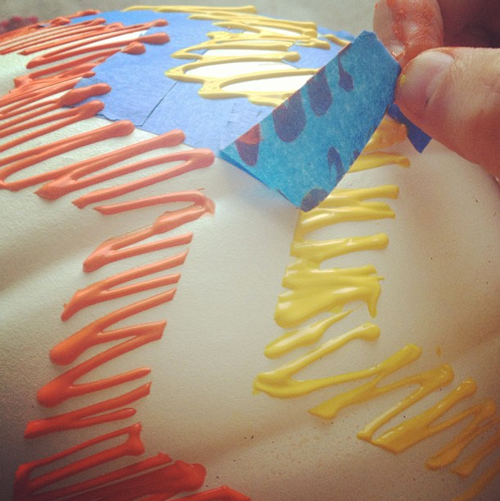 Brenda uses her Sizzix Die to create a batty neck piece you’ll want to sink your teeth into! 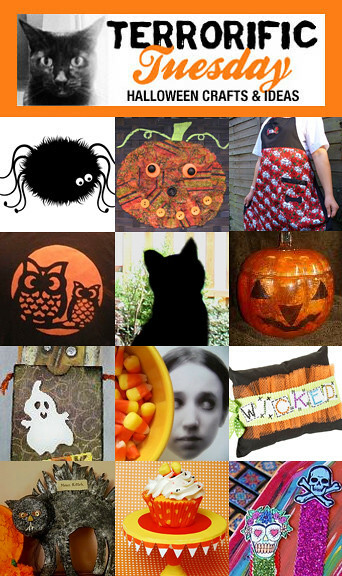 Madge shows you how to make a super cute Halloween tote in this week’s I Love to Create post! The Chica, ILoveToCreate & Craft Zine have teamed up for a skullerific Dia de los Muertos Shrine Contest! 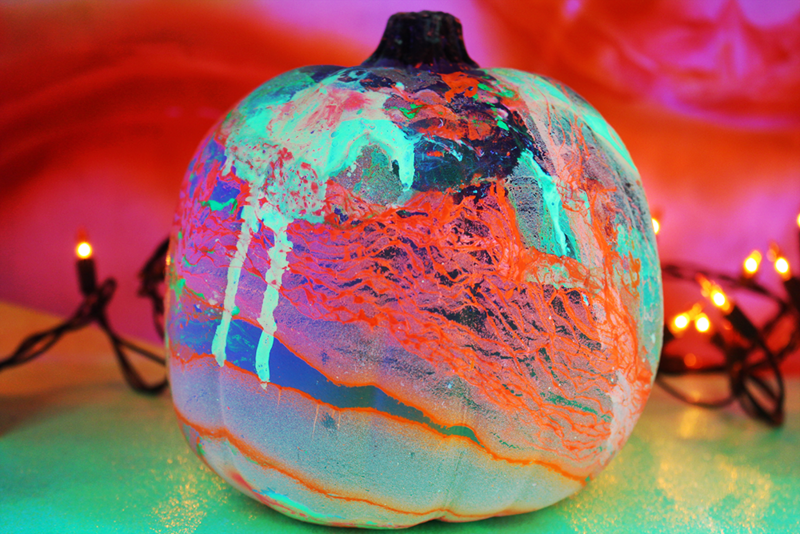 Inspired by her love for True Blood, Swelldesigner takes a stab at bloody white pumpkins!